The red stripe exhibits higher brightness and colorfulness in the light than in the shadow, but is seen as having the same object color, including the same chroma, in both areas. Because the brightness increases proportionately to the colorfulness, the stripe also exhibits similar saturation in both areas. 7.5PB and 10BG Munsell hue pages of RGB colors, showing lines of uniform saturation (chroma in proportion to lightness) in red. Note that lines of uniform saturation radiate from the black point, while lines of uniform chroma are vertical. Also note that compared to the 10BG colors the 7.5PB colors attain higher saturation as well as higher chroma. Saturation scale (0% at left, corresponding to black and white). Colorfulness, chroma and saturation are attributes of perceived color relating to chromatic intensity. As defined formally by the International Commission on Illumination (CIE) they respectively describe three different aspects of chromatic intensity, but the terms are often used loosely and interchangeably in contexts where these aspects are not clearly distinguished. Colorfulness is the "attribute of a visual perception according to which the perceived color of an area appears to be more or less chromatic". A note accompanying this definition in effect implies that the perception of colorfulness evoked by an object depends not only on its spectral reflectance but also on the strength of the illumination, and increases with the latter unless the brightness is very high. Chroma is the "colorfulness of an area judged as a proportion of the brightness of a similarly illuminated area that appears white or highly transmitting". A note accompanying this definition in effect implies that an object with a given spectral reflectance exhibits approximately constant chroma for all levels of illumination, unless the brightness is very high. Thus if a uniformly colored object is unevenly lit, it will generally exhibit greater colorfulness where it is most strongly lit, but will be perceived to have the same chroma over its entire surface. While colorfulness is an attribute of the color of the light reflected from different parts of the object, chroma is an attribute of the color seen as belonging to the object itself (called an object color),and describes how different from a grey of the same lightness such an object color appears to be. Saturation is the "colorfulness of an area judged in proportion to its brightness", which in effect is the perceived freedom from whitishness of the light coming from the area. A note accompanying this definition in effect indicates that an object with a given spectral reflectance exhibits approximately constant saturation for all levels of illumination, unless the brightness is very high. Since the chroma and lightness of an object are its colorfulness and brightness judged in proportion to the same thing ("the brightness of a similarly illuminated area that appears white or highly transmitting"), the saturation of the light coming from that object is in effect the chroma of the object judged in proportion to its lightness. On a Munsell hue page, lines of uniform saturation thus tend to radiate from near the black point, while lines of uniform chroma are vertical. As colorfulness, chroma and saturation are defined as attributes of perception they can not be physically measured as such, but they can be quantified in relation to psychometric scales intended to be perceptually even, for example the chroma scales of the Munsell system. The saturation of a color is determined by a combination of light intensity and how much it is distributed across the spectrum of different wavelengths. The purest (most saturated) color is achieved by using just one wavelength at a high intensity, such as in laser light. If the intensity drops, then as a result the saturation drops. To desaturate a color of given intensity in a subtractive system (such as watercolor), one can add white, black, gray, or the hue's complement. Various correlates of saturation follow. 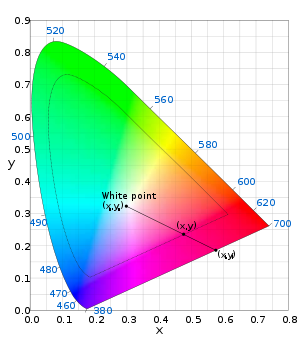 where (u′n, v′n) is the chromaticity of the white point, and chroma is defined below. The CIE has not formally recommended this equation since CIELAB has no chromaticity diagram, and this definition therefore lacks direct connection with older concepts of saturation. Nevertheless, this equation provides a reasonable predictor of saturation, and demonstrates that adjusting the lightness in CIELAB while holding (a*, b*) fixed does affect the saturation. But the following formula is in agreement with the human perception of saturation: The formula proposed by Eva Lübbe is in agreement with the verbal definition of Manfred Richter: Saturation is the proportion of pure chromatic color in the total color sensation. where Sab is the saturation, L* the lightness and C*ab is the chroma of the color. This definition is inspired by experimental work done with the intention of remedying CIECAM97s's poor performance. M is proportional to the chroma C (M = CFL0.25), thus the CIECAM02 definition bears some similarity to the CIELUV definition. An important difference is that the CIECAM02 model accounts for the viewing conditions through the parameter FL. Saturation is also one of three coordinates in the HSL and HSV color spaces. However, in the HSL color space saturation exists independently of lightness. I.e. both a very light color and a very dark color can be heavily saturated in HSL; whereas in the previous definitions—as well as in the HSV color space—colors approaching white all feature low saturation. Excitation purity is the relative distance from the white point. Contours of constant purity can be found by shrinking the spectral locus about the white point. The points along the line segment have the same hue, with pe increasing from 0 to 1 between the white point and position on the spectral locus (position of the color on the horseshoe shape in the diagram) or (as at the saturated end of the line shown in the diagram) position on the line of purples. where (xn, yn) is the chromaticity of the white point and (xI, yI) is the point on the perimeter whose line segment to the white point contains the chromaticity of the stimulus. Different color spaces, such as CIELAB or CIELUV may be used, and will yield different results. The naïve definition of saturation does not specify its response function. In the CIE XYZ and RGB color spaces, the saturation is defined in terms of additive color mixing, and has the property of being proportional to any scaling centered at white or the white point illuminant. However, both color spaces are nonlinear in terms of psychovisually perceived color differences. It is also possible—and sometimes desirable—to define a saturation-like quantity that is linearized in term of the psychovisual perception. and analogously for CIE L*C*h(u*v*). The chroma in the CIE L*C*h(a*b*) and CIE L*C*h(u*v*) coordinates has the advantage of being more psychovisually linear, yet they are non-linear in terms of linear component color mixing. And therefore, chroma in CIE 1976 L*a*b* and L*u*v* color spaces is very much different from the traditional sense of "saturation". Another, psychovisually even more accurate, but also more complex method to obtain or specify the saturation is to use a color appearance model. Here, the chroma color appearance parameter might (depending on the color appearance model) be intertwined with e.g. the physical brightness of the illumination or the characteristics of the emitting/reflecting surface, which is more sensible psychovisually. ^ "colourfulness | eilv". eilv.cie.co.at. Archived from the original on 2017-08-06. Retrieved 2017-12-20. ^ a b c Fairchild, Mark (2013). Color Appearance Models. John Wiley & Sons. , page 87. ^ "CIE e-ILV 17-139". Archived from the original on 2017-04-10. ^ "CIE e-ILV 17-831". Archived from the original on 2017-04-10. ^ "The Dimensions of Colour". www.huevaluechroma.com. Archived from the original on 2017-03-30. Retrieved 2017-04-10. ^ "CIE e-ILV 17-1136". Archived from the original on 2017-04-10. ^ a b "The Dimensions of Colour". www.huevaluechroma.com. Archived from the original on 2017-03-30. Retrieved 2017-04-10. ^ Schanda, János (2007). Colorimetry: Understanding the CIE System. Wiley Interscience. ISBN 978-0-470-04904-4. Archived from the original on 2017-01-17. , page 88. ^ Hunt, Robert William Gainer (1993). Leslie D. Stroebel, Richard D. Zakia (ed.). The Focal Encyclopedia of Photography. Focal Press. p. 124. ISBN 0-240-51417-3. Archived from the original on 2017-01-17. ^ Lübbe, Eva (2010). Colours in the Mind - Colour Systems in Reality- A formula for colour saturation. [Book on Demand]. ISBN 978-3-7881-4057-1. ^ a b Moroney, Nathan; Fairchild, Mark D.; Hunt, Robert W.G. ; Li, Changjun; Luo, M. Ronnier; Newman, Todd (November 12, 2002). IS&T/SID Tenth Color Imaging Conference. The CIECAM02 Color Appearance Model (PDF). Scottsdale, Arizona: The Society for Imaging Science and Technology. ISBN 0-89208-241-0. ^ Stroebel, Leslie D.; Zakia, Richard D. (1993). The Focal Encyclopedia of Photography (3E ed.). Focal Press. p. 121. ISBN 0-240-51417-3. Archived from the original on 2017-01-17.